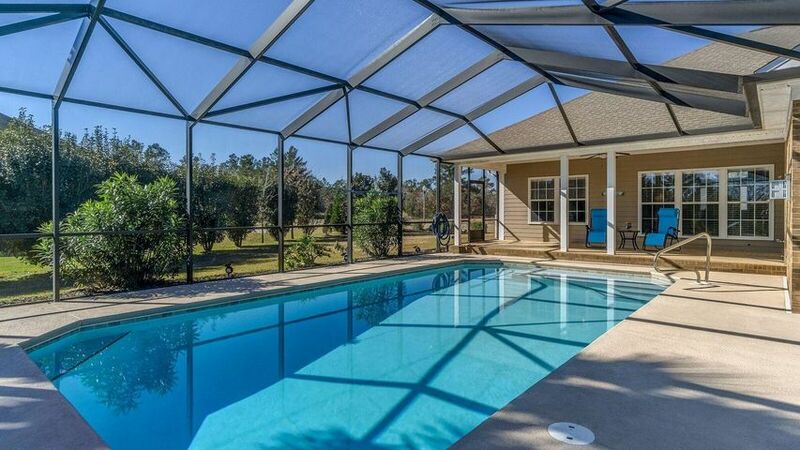 Swim all year with this beautifully enclosed heated saltwater pool. As you enter the foyer of this beautiful, well-built Turner Heritage home, you will see a lovely coastal sitting area with a view of the pool. Recent upgrades include newly tinted windows and beveled glass lighting fixtures throughout. All additional bedrooms have new carpet. There is also a brand new mailbox! This split bedroom 4/3 home boasts 12 ft. ceilings and is located on the 16th tee box of beautiful Windswept Estates. An open concept floor plan features a lovely formal dining room, a kitchen with solid surface counter tops, custom back splash, stainless steel appliances, walk-in pantry, breakfast bar with eat-in dining option, the living room features a gas fireplace focal point and double doors to the pool. The master ensuite features a jacuzzi tub, separate shower, split vanities and two walk-in closets. Additional bedrooms are split with Jack-n-Jill bath and separate guest bedroom with hall bath. The exterior features a sprinkler system with lawn pump. Windswept Estates is a golf course community featuring pool, playground, picnic area, pavilion, basketball & tennis courts. Don't miss the opportunity to own one of the finest built homes in Windswept! Call for your tour today!